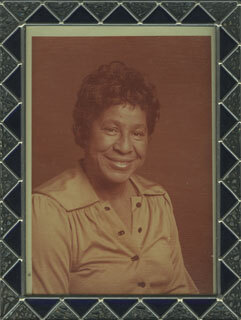 This photo album is filled with moments of our mother's 89 years. The butterfly is the pure symbol of transformation and metamorphosis. 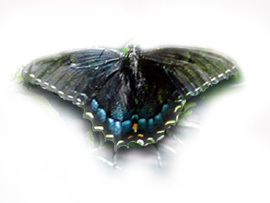 In ancient Christianity, the butterfly was traditionally the symbol of the soul. Through their harmonious colors and joyful fluttering, butterflies seem to do an exquisite dance through life rather than to fly. They remind us not to take life too seriously and cherish each moment as it comes. Whenever we see a butterfly, we are touched by their beauty and divine grace; they give us a feeling of lightness and joy. Whenever a butterfly crosses our path, it reminds us that we can also dance our lives. We can feel joyful and peace at the same time. Mother, our butterfly is always with us in spirit. 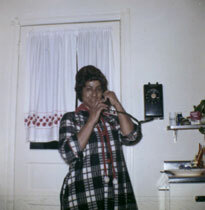 This photo is during the 1960's. Our parents were going to a New Years Eve party. 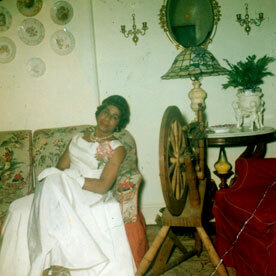 The photo was taken in the living of our home on Providence Avenue in Chester, Pa. 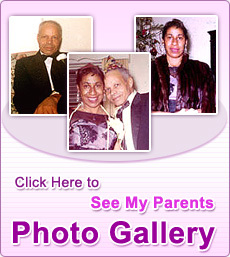 Mom and Pop look wonderful!! 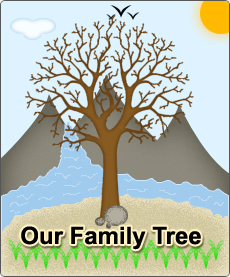 We always celebrated our Christmas dinner with our maternal grandparents in West Grove, Pa. Our grandparents lived and farmed a 100-acre farm. 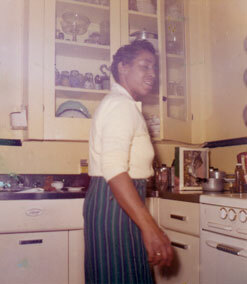 The kitchen was always filled with wonderful holiday smells including roast turkey, sweet ham, collard greens, turnips, pies and much more. Our grandmother used a wood burning oven to cook all the wonderful foods. 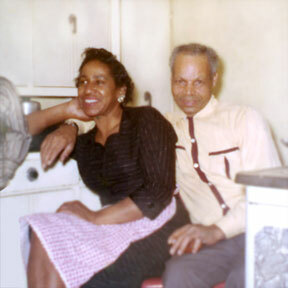 Here is Mom and Pop sitting in the kitchen. 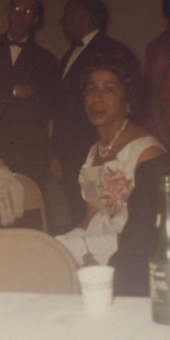 This is mother during her retirement party given by Dr. Rosenburg. Here's mother at two different parties. The photo on the right, she is looking for lost ear ring with good friend Martha Boston. 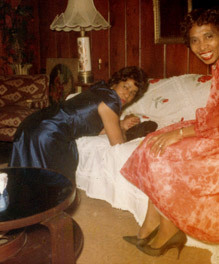 Dad loved to take photos of mother in funny situations. It would drive her crazy. 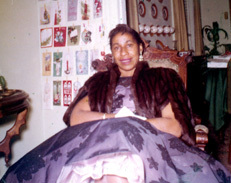 Here's mother prior to going to a New Years eve party in the neighborhood. Notice the hundreds of Christmas cards on the staircase wall. Cards were posted throughout our Providence Avenue home. 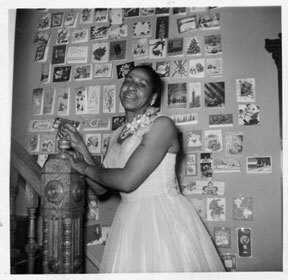 In the 1950s & 1960s, the custom of sending holiday cards was a must for homes throughout America. 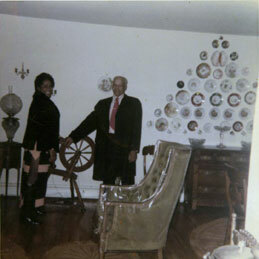 Our parents spent many hours decorating our home during the holiday season. 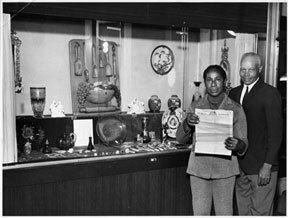 This was a very proud moment for our parents when invited to exhibit some of their antiques in the display case of Delaware County National Bank in Chester, Pa.
Another old black and white photo of our parents at New Years. 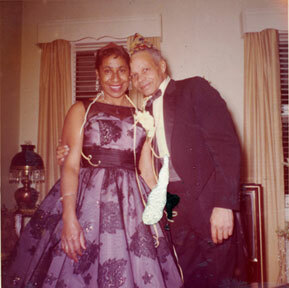 Here's an old photo at one of our father's office parties. 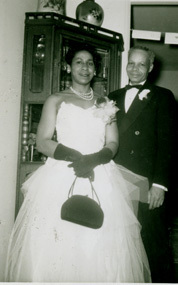 Each year our father's employer, Delaware County National Bank gave an elaborate holiday dinner party at a popular restarant. Given our parents' income, vacations were very limited. 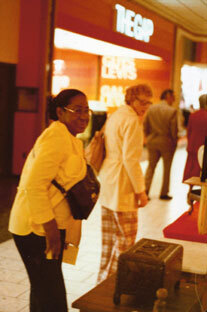 In the mid-1960s, we took a trip to Atlantic City and stayed for two days. It was a very major event for our family. 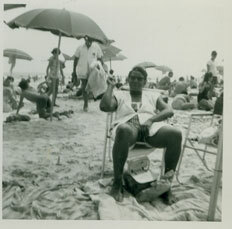 Here's mother relaxing on the beach while watching out as Danny, David and Douglas having fun in the water. Our parents are going to a party from our Barren Road home. Mother is wearing the trendy fashion of the early 1970's. 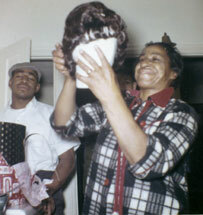 We are sure that if mother was living, she would say that one of the special moments with her children was the Christmas in the last 50's when we purchased her first wig. It was one of the few times when we saw her cry. I think we all cried that day. Mother proceded to call all her friends to tell them about her gift from her family. We all were very proud that day for we had made her extremely happy. It was something that she had truly wanted but thought best not to buy, due to the cost. That was just like our mother who always put her own desires last. Also, that's David in the background. 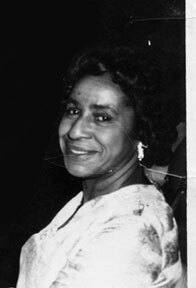 Mother going out to an event in the 1970s. Pant suits were the trend. 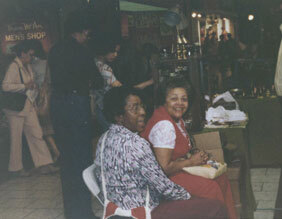 Photos of parents at various antique shows as well as a snap shot of mother gossiping. 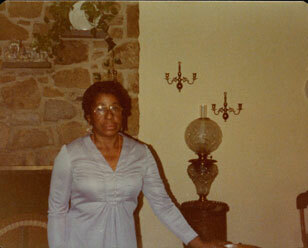 This is mother with long-time friend, Louise Jones of Paoli, Pa. 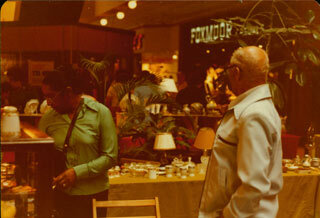 Mother was doing an antique show in a local shopping mall. 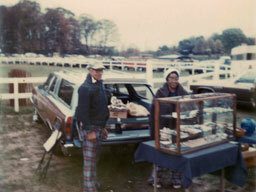 This is one of the first photos of the land which our parents purchased in the 1960s in Cheyney, Pa. It was 10 arces with a 16-feet pond. 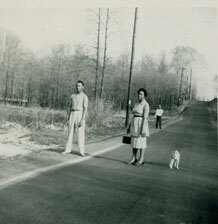 Here's mother with son-in-law, John Shelton Sr. and our childhood dog, Skipper, a Jack Russell Terrier. 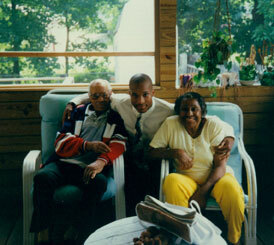 Here are our parents with grandson David Wayne Robinson at Danny's home in West Chester, Pa. in the early 1990s. These were happy moments prior to our father's illness. Various New Years Eve celebrations. 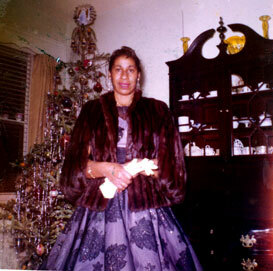 Our fabulous mother on New Years Eve. Mother in the kitchen preparing a meal. 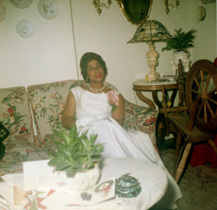 The is the Chester home in the 1960s. 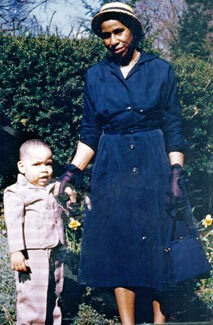 His mother with little Dougie at the John Pew estate. 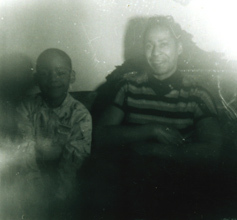 The second photo is mother and Dougie at home in the living room. 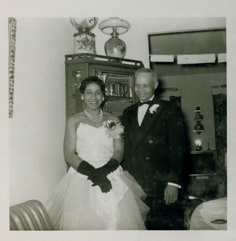 Both photos are from the 1950s.